Elegantly dressed and swathed in a dramatic aura of blue light, consummate entertainer Ian von Memerty, immediately captures a warm response from the audience with I’ve Got Rhythm. 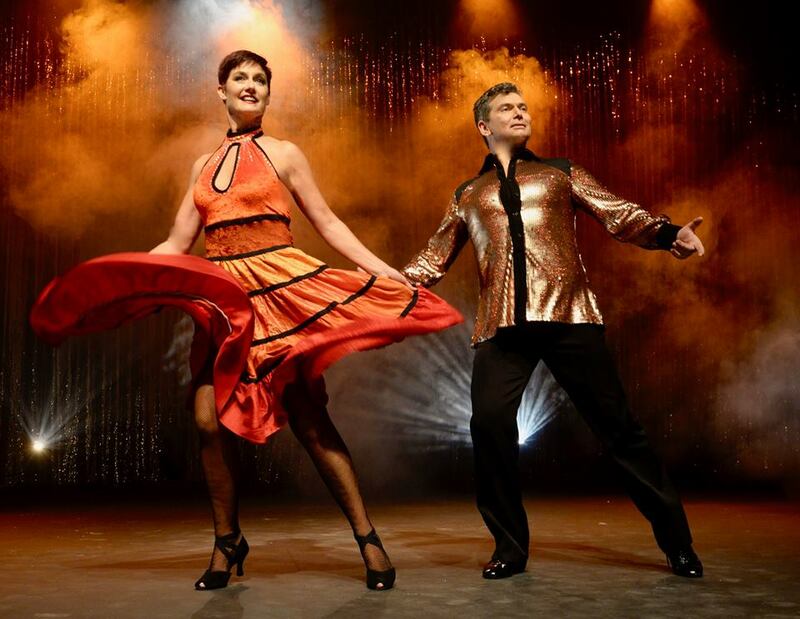 He’s charming, funny, a talented singer, dancer and pianist and the stage is set for a delightful evening of Putting on the Glitz which has a short run at the Elizabeth Sneddon Theatre until April 7, 2019. Smoothly moving into the next number, von Memerty is joined by his wife, Vivienne (Lawrence) who is equally elegant and dressed in sequins and a swirling skirt that billows round her as she pirouettes. A former SA National Latin & Ballroom Champion, Vivienne is well-known for her beautiful dancing and her gorgeous long legs. In this production, she also proves her versatility in just about every dance style under the sun. She also has no less than 21 changes of costume – many of which she has made herself – from glorious sequins to attractive African prints. Ian also changes costume – but mostly it’s changing waistcoats or reversing them! He proudly points out that he personally sewed 1,342 beads on one of Vivienne’s outfits. The show is full of quicksilver footwork, a fantastic range of well-known numbers, often linking them in medleys. There are also some very impressive dance moves where Ian lifts Vivienne onto his shoulders, swings her round and then lowers her down to the splits. It is really great to watch two such experienced and talented dancers ignoring the test of time and still capable of full-on physical energy. Ian and Vivienne have been married for 28 years and tell the audience with delight that they are now free from numerous duties as they no longer have school-going children. They love working and travelling together and so they have gained considerable – and highly enjoyable – experience working as guest artists on luxury liners. Putting on the Glitz is made up of two productions they performed on the liners - A Touch of Class and the African Elegance Show. These also release an abundance of highly amusing memories with Ian showing his versatility with accents as he relates some of the stories and acts out anything from a doddery old man to a snobbish upper-class woman. Because the audiences on the cruise liners come from all parts of the world, they concentrated on classic numbers that would be familiar to everyone. The African Elegance Show was designed to give passengers a taste of South Africa which gives the pair the chance to bounce through numbers like Waka Waka, Home Talk and Pata Pata, singing in languages from isiZulu to Afrikaans: Homeless and Lakushone Langa were reminders that this country carries a lot of pain. Memorable for me were Ian’s piano medley from Bohemian Rhapsody, his poignant interpretation of Memory as well as Mr Bojangles, where he gave the song all the sensitivity it calls for. The show is enhanced by superb lighting design by Lesley Maherry.